Schoolgirl binge drinker Natasha Farnham is the youngest person in Britain to be diagnosed with liver failure – at the age of just 14. The pretty hell-raiser started drinking at 12 and was downing up to six bottles of wine a day by the age of 13. Two years later she was rushed to hospital after drinking a staggering 16 bottles of wine, cider and spirits during a three-day bender. Shocked doctors diagnosed liver failure – usually found in middle-aged alcoholics – and warned her to stop drinking. But she carried on and has now gone into rehab at the age of 18 – where doctors have warned her she will die if she drinks again. Natasha now suffers from permanent memory loss problems and has spoken out to warn other teenagers of the danger of casual alcohol abuse. “I didn’t think my drinking was a problem because all my friends were getting wasted every weekend as well,” she said. “I suppose I thought I looked grown-up and would drink as much as possible – sometimes even passing out. “But now I have no short term memory and doctors warn me that if I drink any more I will die. “I am finally taking the advice of the doctors, perhaps because I’m now old enough to realise how stupid I’ve been. Natasha had her first tipple when she was just 12 – drinking a whole bottle of strong cider. This ignited her “love” for binge drinking and it soon became a habitual weekend trait. But she soon turned into an “alcoholic drop-out” as she started drinking up to four times a week. She stopped attending school at 14 and is now unemployed. “I never questioned what I was doing and my mum didn’t know because I would pretend I was staying at a friend’s house,” she said. “I would save my dinner money from the week and spend it on booze. All I would talk about with my friends was getting drunk at the weekend. Natasha, of Twerton in Bath, Somerset, would steal from her mum Michelle, 40, to pay for her spiralling habit. She said: “At 13-years-old, I hit my lowest point and I would drink up to three litres of wine a day (four bottles), followed by two bottles of Lambrini and perhaps a litre of vodka. “I was missing school but it was fun. I was too young to understand what an alcoholic was, let alone understand that I was one. “When I was told about the liver failure, it was the doctors that looked the most shocked about it. On New Year’s Day in 2004, the youngster was rushed to hospital after becoming lethargic, yellow in colour and feeling sick after a three-day drink binge in which she drank four boxes of wine – 12 litres or 16 bottles. “I had to detail what I had been drinking at the hospital,” said the teen. “The doctors and my mum just looked at me in disbelief. Despite having weekly appointments with doctors, Natasha continued to drink while taking tablets daily for her liver failure. She spiralled into a life of petty crime to pay for her habit and was frequently in trouble with the police. Natasha has four convictions for being drunk and disorderly, two public order offences, one burglary and a caution for assaulting a police officer. It was only when she was arrested for burglary last October that she decided to go into rehab. Natasha pleaded guilty to burglary at Bristol Crown Court last week and was given a two-year community order and a six-month curfew. Sentencing, Judge Julian Lambert told her she was in the “last chance saloon”. Natasha has been attending a rehabilitation programme for the past two months and is finally working with doctors to beat her addiction. 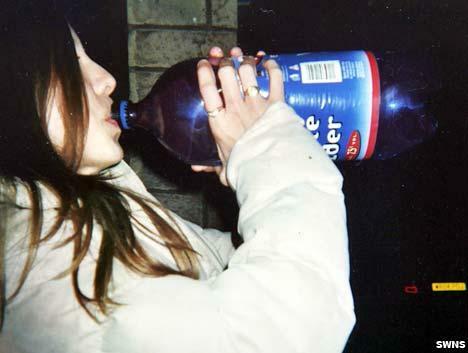 She now claims to be the “victim of acceptable poisoning” and warns youngsters about the dangers of binge drinking. “When I drink, I turn into this horrible, angry person who just wants more and more alcohol,” she said. Her hotel housekeeper mum Michelle added: “When Natasha started drinking it was around the same time that alcopops were being advertised to attract children. “I still stand by the fact that, now we are finally having a backlash of irresponsible advertising. Natasha is believed to be the youngest person in Britain to ever be diagnosed with alcohol-related liver failure, according to the charity British Liver Failure. Spokeswoman Sarah Matthews said: “It would seem that she is very lucky to be alive. “I am sure this is the youngest person in the UK to suffer from liver failure as a result of excessive drinking and still be alive. “There has been three deaths of under 18’s since 1999 and these are all down to this dangerous lifestyle. Natasha’s harrowing story follows official statistics which revealed how police seized more than 37,000 pints of beer and cider from youngsters. In a space of just two weeks, more than 5,000 teens were caught boozing in public, ignoring public health messages and forgoing food in favour of booze. A report last year from charity Alcohol Concern found young girls are drinking nearly twice as much alcohol as they were in 2000. The study showed that female drinkers aged 11 to 13 consume an average of eight units a week, equivalent to four large glasses of wine – more than a bottle. The number of school-age children needing treatment in hospital after binge drinking has shot up 40 per cent since 2002.